Last weekend they lit the whiskey light on top of the Round House on Put-In-Bay – the Lake Erie islands are open for visitors. Port Clinton is at the edge of a peninsula that juts out into Lake Erie and includes Catawba and Marblehead, all of which have ferries to the Lake Erie Islands. 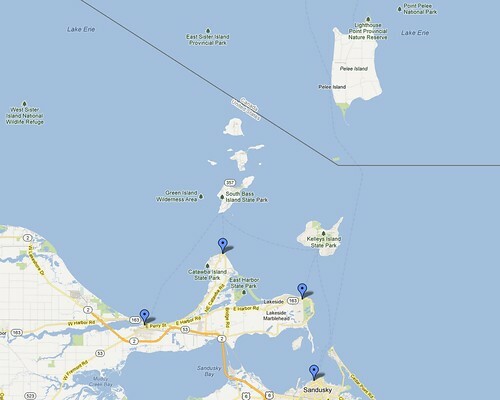 This area is the jumping off point to the Lake Erie Islands, which includes South Bass Island (commonly called Put-In-Bay) and Kelley’s Island. There are tons of things for families and adults to do on the islands, state parks to explore, restaurants and bars to enjoy, and wonderful places to stay. Find out more about each island here. Plan to rent a golf cart or bikes (or bring your own on the Miller and Kelley’s Island ferries) for getting around the island. The Jet Express leaves from Port Clinton and offers round-trip and late-night service to Put-in-Bay and Kelley’s Island. Known as the party boat, it is more expensive and the ride is quick (no puns intended). The Miller Ferry offers passenger/vehicle service to Put-in-Bay and Middle Bass Island and leaves from the north end of Catawba. The Kelley’s Island Ferry offers passenger/vehicle service to Kelley’s Island and leaves from Marblehead. There are also ferries to Canada’s Pelee Island. The Jet Express offers special excursions and Sandusky’s M.V. Pelee Islander offers regular service in the summer. The Pelee Island Winery has a detailed schedule. While my Jet Express experience was “bare-able,” no one I’ve talked to has ever had an experience quite like this. Sure, sometimes there is rowdiness from some partygoers, especially on the late night trips back to the mainland, but that’s usually about it. So while making your vacation plans, consider the underwear question and plan accordingly. Your mom always said to wear clean underwear, maybe it’s time to break free from her motherly wisdom. Or not. Speaking of islands, head to Kelley’s Island this Saturday for some smoking hot Bacon.